TheStreet's Jim Cramer explains how President Obama's stance on net neutrality affects Cisco's (CSCO) stock. NEW YORK (TheStreet) -- TheStreet's Jim Cramer says investors might be wondering how Cisco Systems (CSCO - Get Report) stock could go higher even though the company cut its guidance. Cramer notes Macy's (M did the same thing, but he says Cisco has "a game, set and match situation" against its competitors and says the company has dominated both Alcatel-Lucent (ALU and Juniper Networks (JNPR . But Cramer says the service providers have cut back, largely because of President Barack Obama's stance on net neutrality, in which he went against all the U.S. spending that AT&T (T or Verizon (VZ or Sprint (S might do. Cramer thinks Cisco CEO John Chambers is leading the charge against net neutrality. Cramer points out that Chambers has $52 billion overseas that could be repatriated with the right corporate tax bill. 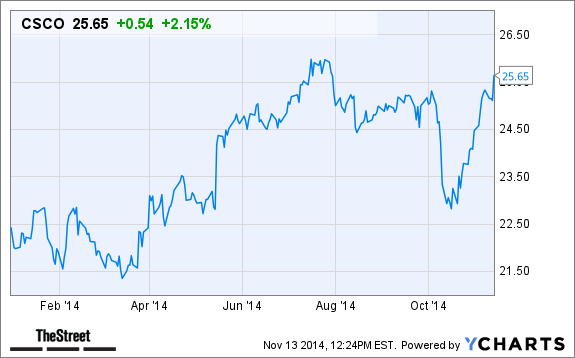 If the service providers start spending again, then Cisco's numbers could explode. Cramer also says Chambers is ready to make a ton of money if the emerging markets come back. Cramer says this stock is finally poised to go dramatically higher with a great buyback and great dividend, and very little has to go right in 2015 for that to happen. Cramer believes the stock goes to $30 if the services providers prevail, the FCC wins and the president drops back. "We rate CISCO SYSTEMS INC (CSCO) a BUY. This is based on the convergence of positive investment measures, which should help this stock outperform the majority of stocks that we rate. The company's strengths can be seen in multiple areas, such as its attractive valuation levels, increase in stock price during the past year, largely solid financial position with reasonable debt levels by most measures, expanding profit margins and growth in earnings per share. We feel these strengths outweigh the fact that the company has had sub par growth in net income."